At 17 I was in high school trying to figure out why my mathematics teacher didn't like me, why the warden had to be so strict, why all the beautiful girls were scared of me, and what was I doing there in school. I had all the time to live my school life day by day. Little short of financial luxury but I had nothing to worry much about, it was a beautiful school and food was sufficient, hostel room was cozy, I only had to wake up in the morning and sleep at night- much of the waking hours went in sleeping and rest hardly mattered. But at 17 young crown prince Jigme Singye Wangchuck not only lost his father, but also his king. Bhutan turned numb at the news but young Jigme had to wipe off his tears midway down the cheeks and answer to his country's calling. He had to leave his playground too soon. He was born a crown prince but was deprived of all boyhood fun, life didn't give him time to grow one day at a time. At 17, I was only half worried about my exam, and damn excited about my winter vacation but at 17 young Jigme ascended the golden throne and gave hope to every Bhutanese. 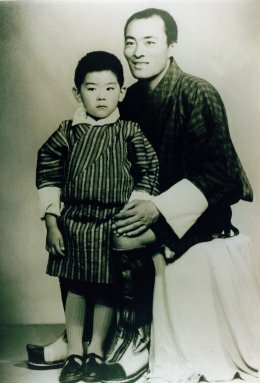 At 17 he became the Fourth King of Bhutan and brought back the warmth in Bhutanese hearts, which they feared they lost forever. At 17, I was trying to make sense of many things in my history textbook. At 17, His Majesty the Fourth King made history by becoming the youngest monarch. At 17, I finally knew a few tricks to survive in hostel thereby ensuring my happiness, but I was yet to understand what makes my teachers happy, and what it takes to keep my mother happy. But at 17, His Majesty the King Jigme Singye Wangchuk kept aside his broken heart and pronounced his dream of happiness for his country and the people, and ever since, every Bhutanese felt the impact of his dreams in our lives. The dream, which the rest of the world could comprehend only now. At 17, what were you doing? At 17 what are our kids doing now? 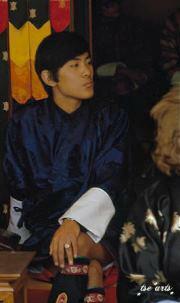 Remember at 17, His majesty ensured happiness for all of us till the end of time. The best way to celebrate the life of the Great IV is to leave behind our excuses and start giving our best! Reflecting back to the time when the king was crowned and observing where Bhutan stands today I cant help but beam with pride and bow to the 4th king for all the huddles he had paved to bring forth Bhutan to where we are now. great and creative approach sir. 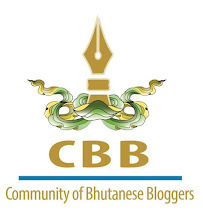 Keep going and take the Bhutanese blogging to a newer height. you are the best at it and we believe in you...Good luck and the best of all the best wishes. At 17, I was in 8th grade. I was running away from my school for no particular reason. I was also busy fishing illegally around chamkhar chhu in Bumthang. at 17 was, i was busy in the night, moving from one apple garden to another. At 17, I was more worried about the assignment of the girl that i liked (loved?) than my own. I was rather happy seeing her even if she said I was ugly. At 17, I didn't even know I was 17!!!!!! But I am all the more happy and grateful for we had King of extraordinary vision..
wow definitely a great entry :) Thank you for sharing this with us...His Majesty the 4th King is definitely a great visionary and a wonderful king that paved way for greatness for our country. I particularly liked your inclusion of the letter part 3rd king had written which i wasn't aware of earlier. Thank You! A very powerful article and many thanks for reminding us what our beloved K4 did to make us what we are today. At 17, K4's visit in our High School inspired me; completed my class 10; worked temporarily for 3 months in Education Central Store to cover my expenses to go to Sherubtse; and it was the year that I lost my V! A very Happy Birthday to your Majesty and may you live another 100 years a healthy life. A happy birthday to our beloved King! wonderful post as always, Passu sir. Well, we owe a lot to our king but then there is nothing extra oridinary we can do to prove how much grateful our king is to us. But, we can do a lot. When at 17, His Majesty could wipe his tears of misery and shower lights of happiness to the entire nation, we definitely can do small things which will make a great difference for the nation in our entire life. working dedicatedly and wholeheartedly for the wellbeing of nation and fellow citizens are the only way to pay back to our kings. Let's study little harder to learn better and serve the country better, let's be punctual and devoted to our work and professions, let's not use the government resources for our own greed, let's help our fellow citizens by providing the services which we can without biasness, and lets respect every laws, and most importantly lets not practice corruption by any means. If one can come forward to safeguard the country from adversities, then this is the best way we can pay back to our king and country. While celebrating the Birth Day and paying tribute to our king, we should reflect within ourselves to know our responsibility as a citizen. At 17, i was such a shy boy in 10th grade, who even fear going for second share in the mess, forget facing the girls and proposing to them. But i tried studying well in our to pass the hurdle for my own good. A wonderful post as always, sir. And you truly described and compared the life HM lived and we all lived and live at that age. Well, at 17, I made the biggest mistake of my life. Long Live Our King, one of the most admirable King in the whole universe. At 17, I had a huge group of friends with 11 of us, both boys and girls in together from different sections. Fate has its own way of bringing people together :D I miss them! At 17 i was chosen as the class captian althought i was called ms bunker. At 17 i was so worried abt my class 12 board exams. At 17 i was wondering how my life would be after high school. At 17 i was searching for a good college. At 17 i made the mistake of joining USTC(Bangladesh). At 17 i gained a lot of weight.